An enchanting island, steeped in myth and romance. Cyprus has been welcoming visitors for thousands of years with the Romans and Greeks having all added to the island’s culture. And now, holidays in Cyprus offer superb beaches, secluded villages, cosmopolitan resorts, unique historic attractions - with new direct flights from Dublin to Larnaca and Paphos. This offers a great alternative to Spain and Portugal for Irish holidaymakers. As demand is exceeding supply in most Spanish and Portuguese resorts and prices are high for the summer months, Cyprus offers value, guaranteed sunshine and beautiful beaches with resorts steeped in history. Cyprus has one of the best climates in Europe, with pleasant temperatures year round. Boasting glorious highs of 30°C and up to 14 hours of sunshine a day, summer is the best time to hit the beach in Cyprus. 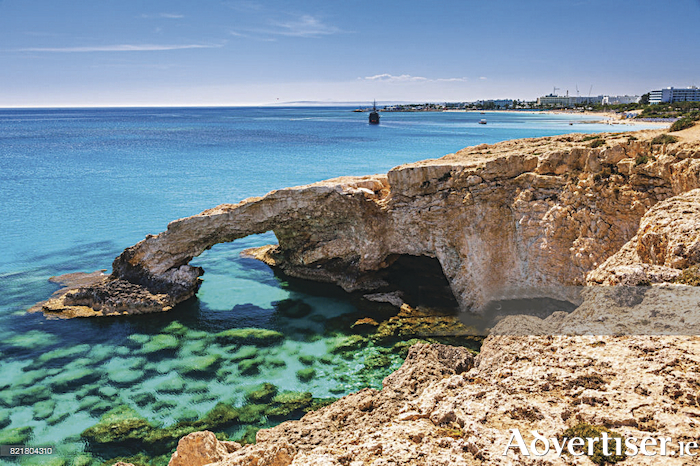 Thanks to its sandy beaches, ancient sights and up-tempo nightlife, Cyprus is a firm holiday favourite, attracting everyone from families to clubbers. Beautiful beaches and a mix of laid-back and lively resorts fringe the island. And if you go inland, visitors will find sleepy villages, hidden hamlets and the scenic Troodos Mountains. The Larnaca region of Cyprus is home to the family-favourite resort of Protaras. Its golden beach and clear shallow waters are a winning combination for anyone with little ones, and its main strip has a good mix of restaurants, cafés and bars. Further south is Ayia Napa. It is best known as a clubbing mecca, but it is also home to one of the island’s best beaches and has a pretty old town. Neighbouring Nissi Beach completes the trio of resorts. It boasts a waterpark and white-sand beach with its own islet. To book a holiday to Cyprus, call Corrib Travel 091-564713 , or visit the office at 2 Eyre Square Galway.